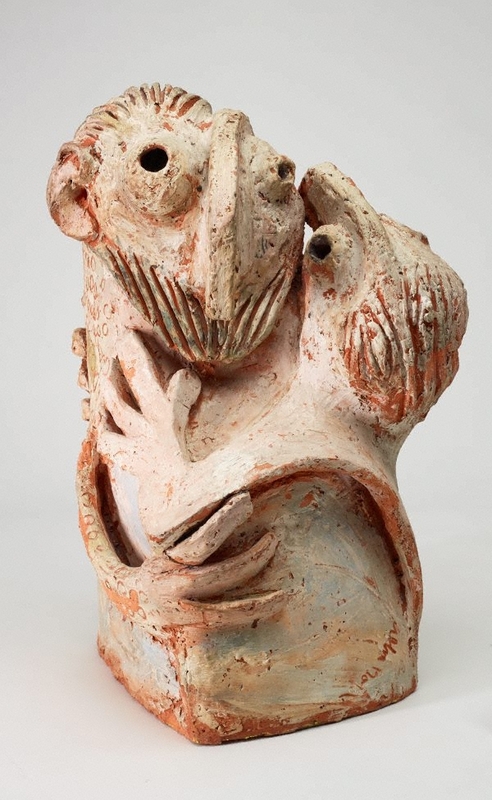 In 1954 Boyd exhibited sixteen terracotta sculptures at the Peter Bray Gallery in Melbourne. 'Judas kissing Christ' was one of four pieces which depicted themes from the New Testament, the remainder being genre subjects. Working from the Arthur Merric Boyd Pottery in Murrumbeena, which he, John Perceval and Peter Herbst had established in 1944, Boyd also produced ceramic paintings on tiles, such as 'Christ walking on the water' 1950-52, extending the medium through extensive experimentation with firing methods and lead glazes, to create a 'stained glass' effect. His father Merric Boyd, one of Australia's first and most talented studio potters, instilled in his son a vision of pottery as a medium for serious artistic vision. "I can remember a few occasions when I felt very pleased for a short time and one was when I first took some very big pieces of ceramic sculpture out of the kiln. I had built a kiln for firing ceramic sculpture in the backyard of the old house at Murrumbeena ... It was the first sculpture I had done of any size ... and then opening up the kiln and taking them out while they were still very hot ... this was very exciting."